Is the Sprague mansion haunted? 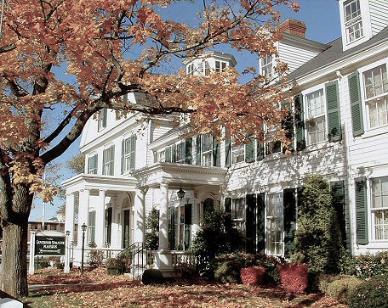 The Sprague Mansion on Cranston Street has seen its share of Rhode Island history. It was the home of William Sprague II who was one of the first men to print calico cotton cloth in abundance at affordable prices. It was the setting for the funeral of Amasa Sprague after his battered body was disocvered in Johnston on New Year's Eve 1843. His murder changed capital punishment in Rhode Island when a rush to judgment may have put the wrong man to death on the gallows. This was the home of Col Amasa Sprague. He and his brother William Sprague 4 were the richest men in America at the time of the American Civil War. The A. & W. Sprague Company was printing calico cloth in the millions of yards. The Bell of Washington, Kate Chase and her father, Salmon P. Chase, Secretary of the Treasury (later Chief Justice of the Supreme Court) visited here before she married Senator William Sprague. This house was the site of the where Col Amasa Sprague thought of incorporating the Union Horsecar Railroad the fore runner of the Rhode Island Transportation Bus Line and here he decided to build the Narragansett Trotting Park because he did not like the corruption and gambling that was happening to the sport of the trotting horses at Washington Park. After the fall of the A. & W. Sprague Company in 1873 the Narragansett Park changed hands many times and served Rhode Island well as a back drop for much history including the Rhode Island State Fair until 1899. In December of 1843, Amasa left his home to set off on a business trip. The following morning, Amasa's body was found close to the Sprague estate, beaten too death. The main murder suspect was a man named John Gordon, whom Amasa had refused a liquor license. John Gordon, guilty or not, was hanged for the murder. Unfortunately, new evidence came to light later on and it seems Mr. Gordon was actually innocent of the crime. The real murderer was never found and his or her identity remains a mystery today. Paranormal activity has been reported in the sprague mansion since the early nineteen hundreds. The first apparition to be added to published reports is that of a man, whom I assume is still seen today, walking down a staircase in the house. This man is believed to be Amasa Sprague. This same apparition has been seen in the wine cellar and is also believed to be responsible for cold gusts of air in that area. Some of the activity in other parts of the house includes: bedding being unexplainably pulled off of the beds, even while people were sleeping in them. In the "Doll Room," lights have been reported to flick on and off on their own, phantom footsteps have been heard, and many have reported feeling a presence in the room with them.